Good for dry and damaged skin. 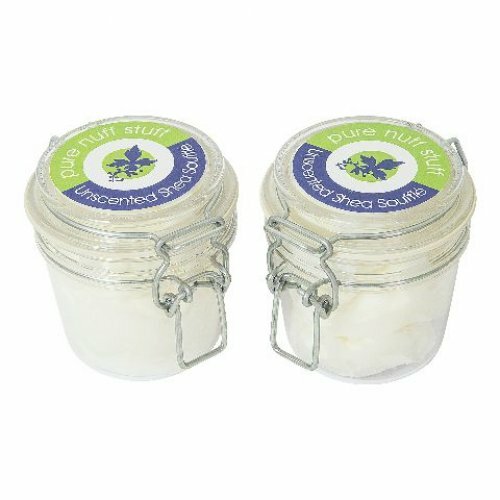 A solid white butter sourced from shea nuts, this is packed with essential fatty acids and nutrients and is excellent for treating dry, damaged and more mature skin. Its gentle soothing and healing properties work well with all skin types – we use it in our facial moisturising products, Shea Soufflé and Massage Bars. Beautifully moisturising all on its own, shea looks solid but it does that thing that chocolate does and melts at body temperature, so it's perfectly easy to use straight from the pot. It's lovely! Difficult to rub in but worth it. It soaks into the skin overnight and you can really feel the difference! Slathering myself in pure nuff stuff Shea butter goodness :) hard work but worth the results, best skin savior ever! A rich, intensively moisturising oil with a delicious aroma.